Dust explosions cause some of the most dangerous incidents in the process industries today, so dust management is a key consideration. Sean Ottewell reports. Generally speaking, dust emissions can be treated using two different techniques – dust aspiration and wet dust suppression. The first can be costly and also inflexible if a building needs modifying. The second can increase water consumption and also humidity – which in turn increases the risk of problems such as clogging. Cap Minerals uses the water spraying principle, but with a very important difference: according to users’ needs and situations, the company can provide different processes which use either water alone, an ultra-fine air/water mixture, or a high-pressure solution. For example, in some situations the company treats dust particles using decompression exhaust hoods. The design of these varies according to the type of material, its granulometry, the type of grinding-crushing mill used and the width of the conveyor belts being used. Such exhaust hoods allow limited dust zones and by their design slow down the dust flow caused by grinding chambers. Atomisation systems are integrated into the exhaust hoods. This process consists of water micronisation which leads to fog sprayed over dust on the minerals. Atomisation is obtained by a regulated water and compressed air mixture forced through ultrasonic nozzles that split into millions of 15 micron-diameter micro-drops of water. According to Cap Minerals, the advantage of atomisation is that it requires very little water (a maximum of five litres/h/nozzle) and thus avoids risks of sludge and other build-up that could be linked to too much humidity on the materials. At the same time as atomisation, the company also employs a complementary technique of micro pulverisation on different strategic points in the installation. Spraying is performed using hydraulic sprayers that work with water pressure and whose flow can be varied according to needs. Another technique involves spraying the primary hopper. This technique prepares materials where permitted with a larger amount of water, such as on primary hoppers, grinding mill feeding and larger mats where minerals or materials will be stored on the ground. Unlike atomisation, micro-spraying does not need to be hooded as it is less impacted by the wind. The company’s processes are capable of working in two different modes. The first is automatic, in which control enclosures are directly linked to and controlled by the user’s automation system. The second is manual. Here operators can turn treatment points off and on independently. Sealpump Engineering offers complete solutions for the control of dust in all material handling processes, from its dry fog dust suppression systems to rain gun and sprinkler systems. The dry fog dust suppression systems control airborne dust without wetting the product or site machinery, adding very little (usually less than 0.1%) moisture. The systems are fully installed and integrated into all processes and suppress dust without the need for expensive extraction systems. Research in the development of the company’s dry fog dust suppression systems showed that when water droplets are produced equal in size to that of dust particles, the airborne dust is suppressed through particle agglomeration. Sealpump’s engineers visit potential sites to carry out surveys and discuss individual needs to ensure that this process is as efficient as possible. For example, when it comes to conveyor transfer points and conveyor belts, the placement of the dry fog nozzles is the most important aspect to achieving effective dust suppression and ensuring no wetting of material. So the dry fog spray should be generated and contained in well-designed shrouding, for example a conveyor chute, which eliminates dissipation due to wind. It also ensures the correct treatment time necessary to suppress and control airborne dust. The dry fog spray is generated above the dust problem area, not directly onto the material. As the airborne dust is generated within the conveyor transfer chute the dry fog suppresses the dust through particle agglomeration, ensuring that the dust is controlled within the conveyor transfer chute. When it comes to specifying the number of nozzles required at a given problem area, Sealpump says there are a number of general considerations to be taken into account: tonnage per hour; type of material being conveyed; condition of material; future use of the material, belt width; height of fall; and convenience of mounting space/maintenance. A general rule of thumb is that the height of the conveyor cover be approximately one metre above the product level on the belt and the cover length three times the belt speed. For Mist-Air Environmental, the secret of success lies in a novel dry fog system. Dry fog is formed to absorb fine airborne dust immediately, keeping the dust where it is formed. No wetting occurs - so personnel, floors, machinery and stock stay dry. Mist-Air systems are currently fitted to hoppers, conveyors, shredders, wood chippers, crushers, screens, trommels, storage buildings, extraction towers and vents. Customers include recycling works, foundries, waste water treatment works, chemical disposal sites, and sludge handling sites. An added advantage is that the systems create flash evaporation, so that cooling takes place on hot days – removing the heat from steel-clad buildings and making the working environment much more comfortable. Meanwhile Sandvik says its dust suppression systems offer a novel and environmentally friendly way to control dust emissions at conveyor loading and transfer points. Quiet, efficient, water-free, easy to maintain and very cost-effective, they use less than 800 watts of electricity to capture around 95 per cent of airborne dust particles. The dust is then made to rejoin the product and add value to the process (Fig. 1). For example, the company’s HX410 dust suppression systems exploit the principle of ionisation to deliver a positive charge into airborne dust particles. Once charged, the particles are attracted to grounded surfaces including the system’s stainless-steel casing and the product on the belt. Suitable for use with a wide range of materials, the HX410 system is available in a range of standard sizes and can be tailored for almost any conveyor with belt widths up to 3000mm. Application areas are many and include: quarries, sand and gravel pits; mines; steel works; cement and glass works; foundries; pulp and paper mills; limestone; iron ore; coke; and potash. Ravensdown Fertiliser Co-op in Napier, New Zealand, had a dust problem while bulk loading fertilisers into its general store. Trucks, front end loaders and staff were all working in a dirty, low visibility situation and the potential for an accident was high. DSH Systems provided an innovative solution with the installation of 49 hoppers at Ravensdown’s distribution points. "We use the dust suppression hoppers on our load-out points; truck and rail and also the dress belt into store, a drop of 14.5 metres. The hoppers have been a great success in cutting down the dust problem and make visibility a lot easier and provide a perfect pour when loading. Not only are we happy, but truck drivers and transport companies are thrilled as there's less debris over their trucks,” says Ravensdown North Island project manager Hugh Eaglesome. Another benefit is that the hoppers can easily be adapted for other bulk loading purposes. “The computer controlled model pours perfectly every time and is great for loading spreaders with small bins,” he adds. Loading can be continuous without plant interruption. The DSH system concentrates the fertiliser as a tight solid column through free air into any target repository including trucks, rail cars, storage containers, bags or stockpiles. As the loading plant does not require dust extraction, the entire product is sold. So the manufacturer does not have to install dust bag-houses or pay for dust disposal. 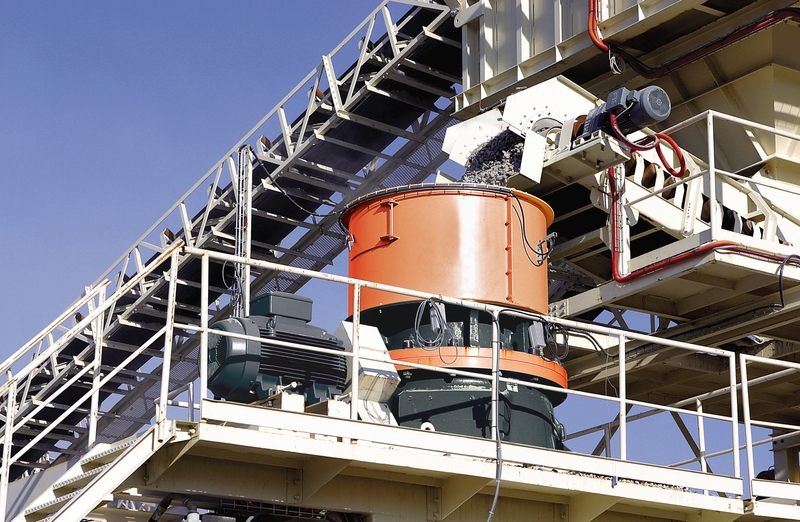 Text: DCL offers a large selection of dust collectors and bin vents in a choice of construction materials to allow handling of all types of products, including fine, granular, lumpy, abrasive and corrosive materials. Ventilation modules are available in sizes from 185-750ft2 of filter media, while the company’s innovative compact filter modules area available in sizes from 155-660ft2. Filter media is available to accommodate most applications. DCL’s exclusive pleated design, spun-bonded media features a smooth finish with exceptional dust cake release. The filter surface is calendared and compact to make it resistant to particulate penetration – giving users better cleaning efficiency and less downtime for cleaning. The company’s compact air filters remove dust from loading spouts and discharges particles back into material flow. They come in sizes up to 660 ft2 of filter media with up to 5,000ft3/min of air withdrawal. Meanwhile its dust collector/bin vents collects dust from multiple transfer points using a series of duct work. Specifications here are: sizes up to 3,000 ft2 of filter media with up to 18,000 ft3/min of air withdrawal. DCL’s ventilation modules are designed to filter dust from a single point and discharge particles back into material flow. These come in sizes up to 750ft2 of filter media with up to 6,000ft3/min of air withdrawal. The company says much of its success is due to the innovations developed by an in-house R&D team. According to DCL, these include a number of industry firsts: a full-length inner spout cone set; high-efficiency pleated, spun-bonded filters in a compact spout filter module; fully-automatic hands-free truck loading system; and low-horsepower silo aeration reclaim system for fine products.